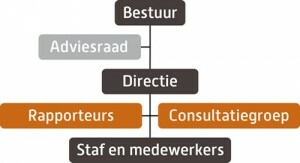 iMMO has a permanent core bureau (‘staf en medewerkers’) comprising medical, psychological and legal expertise. These staff members cooperate with a network of assessors (‘rapporteurs’), professionals – as a rule physicians and psychologists – who perform the actual assessments (on a voluntary basis). The office manager and legal assistant, provide logistic and administrative support. The general manager has the overall management responsibility for the organization; she also primarily represents iMMO in the relationship to external parties. The consultation group (‘consultatiegroep’) is composed of a number of experienced assessors, who have a role in the quality assurance of assessments and the training of new assessors.